Whoa! Where did you come from, pal? We totally didn’t notice you there, gazing at this page. Those are some serious stealth skills, buddy. We honestly had no idea that you were there! Have you ever thought about putting those talents to good use? If not, then you may just want to consider your future as a ninja! You can go about blending in with the shadows and enter rooms without a sound. Your footsteps will disappear; the sound of your breath, erased! 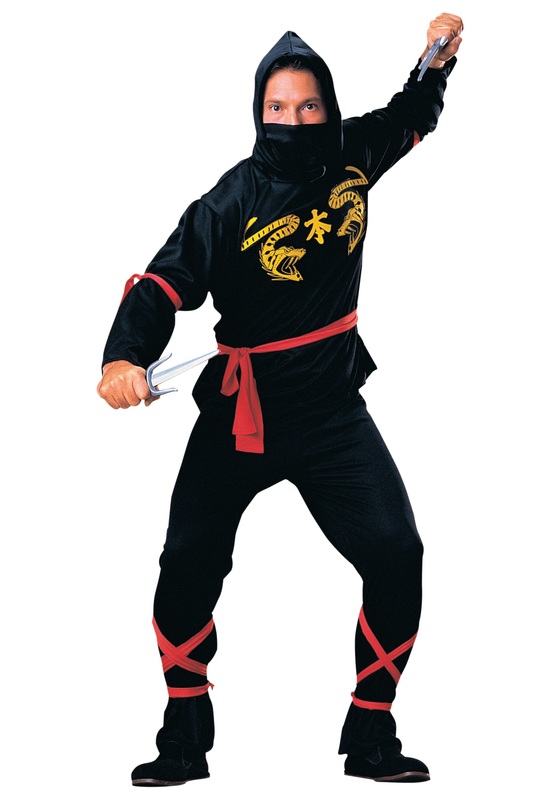 In this Men’s Ninja Costume you can harness all that cool undetectable energy you seem to have going for you into a pretty rad Halloween costume (and maybe even future profession if things go well)! This look will definitely make you feel like the center of attention at any party, but you will still be virtually invisible as you venture out, becoming one with the darkness. Ahh! There you are again. How did you DO that?! Ok, well, now that we have you here (and visible), we’d love to tell you about the details of your new identity. Your mission requires that you wear this black hooded shirt--with its gold snakes printed on the front--and matching pants. The black face scarf will conceal your identity, so whether you bring a set of toy sais or plan to go hand-to-hand, you can enjoy your new secretive persona and surprise everyone with your stealth skills in this look! Happy ninja-ing!